Rolling Plains Management Corporation operates a rural public transportation system, SHARP Lines Rural Public Transportation, for residents of Archer, Baylor, Cottle, Foard, Hardeman, Jack, rural Wichita , Wilbarger, and Young counties. SHARP Lines provides transportation to medical, dental, eye centers and social service agencies. SHARP Lines has available transportation for the general public, school children, senior citizens and disabled citizens. 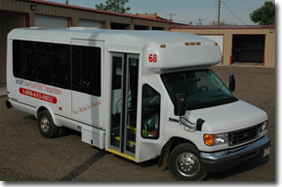 Most vans/buses in the fleet are equipped with wheelchair lifts for the disabled.